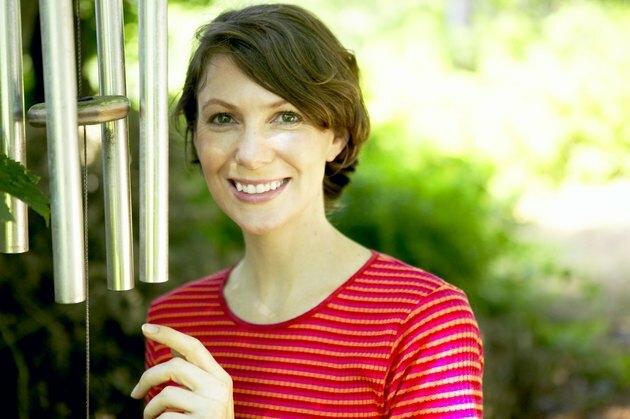 You can use any resonating or sound-creating objects to create a unique wind chime. As long as the dangling object makes noise without breaking when blown around in the wind, you can use it to create a wind chime. The outdoor decoration offers an artistic and melodic embellishment near any door or window. The most popular materials for wind chimes are bamboo, glass and metal. Wind chimes that use bamboo tend to create earthy and/or exotic-themed decorations. The hollow bamboo can be used to create a musical tube or bell for the wind chime. Hang nine long bamboo pipes of assorted lengths from a round disk to create a simple bamboo wind chime. Carve a vine-and-flower pattern spiraling around each bamboo piece and hang the pipes from a flower-shaped disk to create a wind chime with a floral style. Cut wide bamboo tubes into short cylinders to create bells for earthy wind chimes. String each tube with a large wooden bead and hang the bells from a thick bamboo ring. Hang short, medium and long levels of the bells to create a large bamboo wind chime. Scatter simple bird carvings around the bells for a classic style. Glass wind chimes require thick and strong glass shapes to prevent breakage problems. Glass chimes tend to be the most fragile type of wind chime, but they can also be the most attractive. Use a tree-shaped piece of glass strung with thick, green, leaf-shaped pieces for a forest theme. Use a red and pink glass heart base with dangling strands of interchanging red, pink and white hearts for a romantic theme. Hang a wavy, rectangle piece of frosted green glass at an angle to create the base for a glass wind chime with a modern theme. Hang small, wavy squares of green and white glass squares to create the chimes. Use dark blue, light blue and white glass for a watery theme or red, white and blue glass for a patriotic theme. Metal wind chime ideas may take more time to execute, but they tend to produce the most durable decorations. Hang thin, silver pipes from the bottom of a thin, butterfly-shaped piece of silver metal for a sweet style. Use a snake-shaped copper ring hung with a spiral of snake-shaped copper pipes for an unusual style. Top thin metal pipes with plastic fairy figurines and dang them from a plastic disk for a fantasy style. Combine small and medium-size metal bells to create fancy wind chimes. Use snowflake-etched, frosted silver metals bells for a winter theme. Hang a metal snowflake decoration below each bell knocker to help catch the wind. Use flower etchings and decorations for a spring theme, suns for a summer theme or leaves for an autumn theme.